Offering a complete Made to Measure service on a large variety of blinds, fittings and window covering services. Based in the heart of the Lake District, our free consultation and measurement service is available throughout the area in both domestic and commercial properties of any size or style. We pride ourselves on prompt delivery and highly professional installations on all jobs undertaken. Our highly experienced installers are also at hand to make recommendations if you are unsure where to begin. We offer a huge product selection including roller, vertical, wooden venetian, metal venetian, vision and mirage, roman blinds and pleated blinds, all from some of the world's finest brands and manufacturers. The new one touch wand battery operated or lithium ion remote control operated system is also available in the stunning "Vision" range - the ultimate combination of style and privacy available in a variety of styles to suit any home. Whether its one blind or an entire building you can be sure to receive the same level of personal service and attention to detail. Contact us now to arrange for your free consultation. 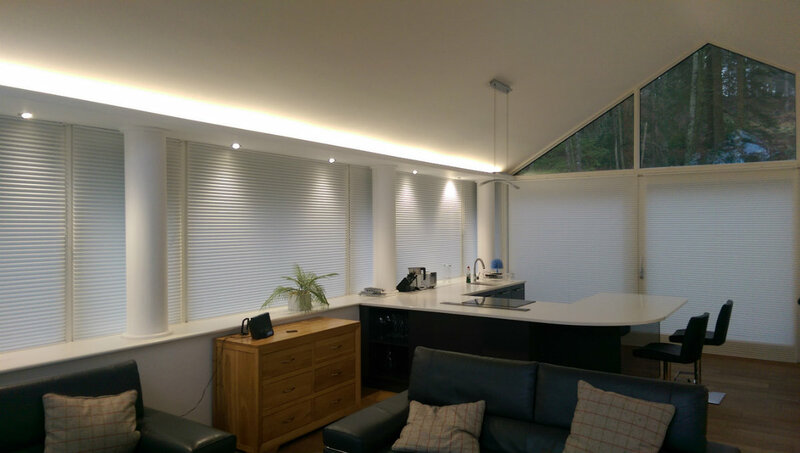 Every type of blind requires certain allowances to be made to the measurements to ensure the end product fits and operates how it was designed to, with this in mind why not take advantage of our 14 years of experience and book your free measure and consultation.